Umaid Bhawan is one of the most gorgeous wedding venues you can imagine to set your wedding day against. Made completely out of Chittar sandstone, this palace plays host to the rich and famous. It’s set against the backdrop of the Blue city of Jodhpur and its architecture is a confluence of Victorian and Rajput influences. The Umaid Bhawan Palace is home to one of the grandest ballrooms in the world- The Marwar hall. The 4,500 square feet Marwar hall has a same sized ballroom at the opposite side called the Mewar Hall. Together they are a sprawling 9000 square feet of event space. 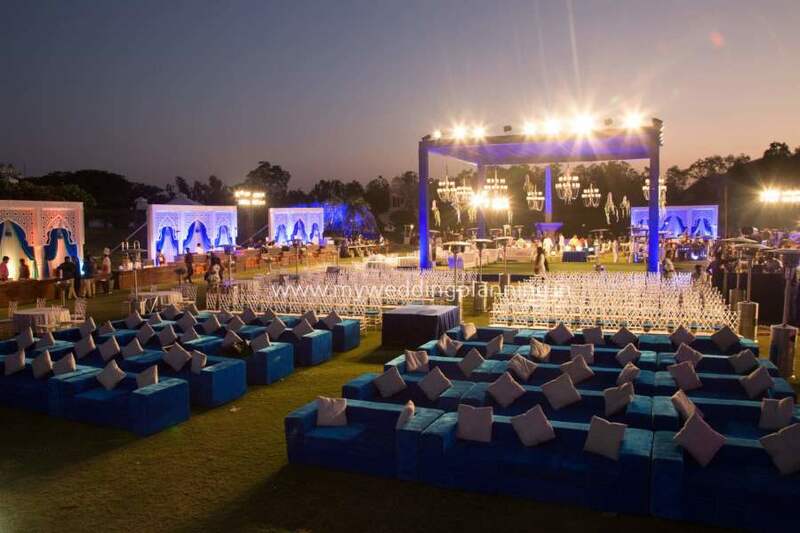 If you wish to have your wedding outdoors, the Baradari lawns that extend to 17500 square feet is perfect for your big fat Indian wedding. The Baradari Lawn also features an exquisite Marble Pavilion. The 450 sq feet royal tent in the back lawn is ideal for a mehendi. Enjoy traditional rajasthani food along with a lavish spread of cuisines from the world over. Located in the heart of the pink city of Jaipur, the former hunting lodge and residence of the Maharaja is today one of the most sought after wedding venues in India. Suvarna Mahal, the grand ballroom of the palace is the perfect setting for a royal palace wedding. Feel like royalty as you get married at Rambagh Palace. The gardens of Rambagh are great for reception parties. Guests will be in awe of the lavish spread of food as well as the unique and intricate artwork adorned in the rooms in this regal paradise. Gajner palace is one of India’s secret gems that stretches over 6000 acres of land. This sprawling majestic palace, with its distinctive terraces and balconies is revered for its architecture and natural beauty. Host your royal wedding in this beautiful heritage property that was converted into a hotel in 1976. Each suite has been meticulously restored to its original grandeur. Every detail, from the furniture to the wallpaper, the four-poster beds and picturesque windows has been carefully recreated exuding an aura of a bygone age. All rooms have been thoughtfully fitted with modern conveniences. This lakeside palace-complex adjoining a sanctuary, in the middle of Thar desert is an ideal place for a royal feast wedding. Faluknama also known as the Mirror of the sky, was once the home of the famous Kohinoor and Jacob Diamonds. Perched at a royal 2000 feet above the city, the venue plays host to the most expensive weddings. The 101 Dining Hall with the world’s longest table, seats 101 guests and is perfect for formal sit down dinners. The Faluknama Palace has many outdoor lawns that can be used for a grand wedding. The Rajasthani gardens has a space of 9000 square feet. 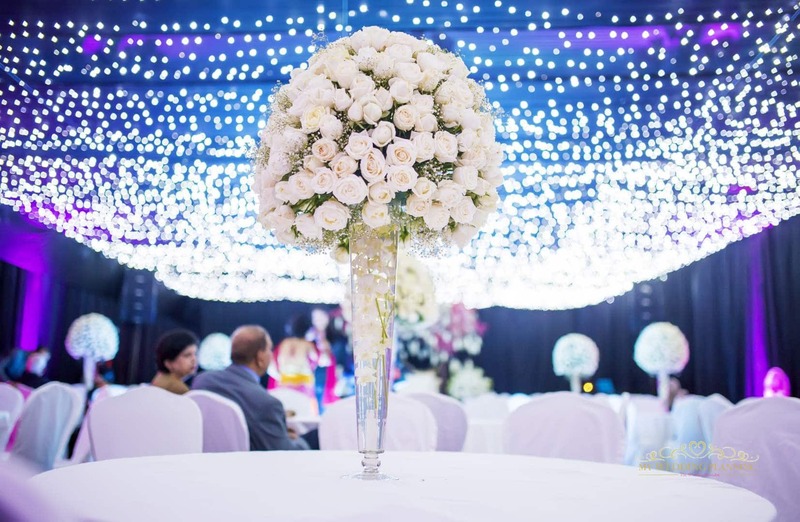 The indoor ballroom called the Durbar hall is as grand as it can possibly get lit with chandeliers all the way. The Jade room, with its hand-painted Victorian ceiling is equally beautiful for an intimate family pre-wedding function. Stand before the Palace facade, the Gol bungalow or the stained glass dome for spectacular photos that will mark the beginning of your fairytale union. The gem of Udaipur, Taj Lake Palace hosts some of the most talked about weddings in India. The exquisite Lake Palace of Udaipur is like a pearl that emerges from the placid waters of the lake. Once the summer palace of the king of Mewar, Taj Lake Palace is perfect for an intimate wedding. Guests will be escorted to a ferry to cross the lake. The Jag Mandir palace is a great setting for weddings and receptions alike. Soak in the tranquility of the quiet waters surrounding you, and enjoy walks around the grand elephant-flanked facade and verbena scented gardens. For centuries, the Laxmi Vilas Palace has been a witness to almost every eventful happening that took in the princely state of Bharatpur – Royal weddings, affairs of the court and the Royal duck shoots. It has played host to such dignitaries as the Duke of Edinburgh, Shah of Iran, King of Nepal and Shah of Afghan. There was of course enough to entertain those who entered the portals of the Palace. Feasts and festivities lasted for days, and the Palace kitchen ensured that the only gourmet cuisine arrived at the dining table. The same traditions of hospitality have been kept alive till the present day. In 1994, a decision was taken to convert the palace into a hotel. The Laxmi Vilas Palace has been operational ever since. Though the Laxmi Vilas Palace is now a premier heritage hotel, it is first and foremost a Royal residence with the family of Raja Raghunath Singhji staying in the Palace . Even today the traditional pujas and ceremonies, especially of Dusshera and Diwali, take place in the ceremonial rooms. While restoring and refurnishing the Laxmi Vilas Palace care was taken to preserve the royal character and the spirit of the property. The furniture, furnishings, even the photographs and paintings on the walls reminded one of the gracious days of the Raj. Laxmi Niwas Palace has hosted many exclusive weddings and is royalty at its best. Gaze at hand-painted sculptures and gold-laden walls as you soak up the regal environs of the Palace. The guest rooms are unique in character with high ceilings, king size bed, sofas, 2 sitting rooms that adds to the luxury. Words wont do justice to describe the opulence of the palace! It is a grand old Palace with sumptuous sitting rooms, bar rooms and dining rooms that are filled with antiques, old photographs and hunting trophies. A beautiful mix of Rajput, Mughal and European architectural influences, the City Palace in Jaipur is one of the most premium palace complexes in the world. Ideal to host a big fat Indian wedding, the palace has many lavish courtyards and gardens. A major part of the City Palace in Jaipur now consists of the ‘Maharaja Sawai Man Singh II Museum’. It is also the residence of the Jaipur Royal Family. City Palace Udaipur is one of the most beautiful palace complexes you will ever see. A pleasing honeydew gold color, the palace complex is one of the largest in India. Perched on a hilltop, the palace offers a splendid panoramic view of the city as well as of lake Pichola. The Zenana Mahal, Mor chowk, Manek Chowk, Badi Mahal and Moti Chowk are among some of the most sought after and flamboyant wedding venues in India. Other grand palaces that are perfect to host your dream palace wedding are Lallgarh Palace in Bikaner and Noor-Us-Sabah Palace in Bhopal. For help planning and executing a royal palace wedding, email us: weddings@myweddingplanning.in or call us on 9820215215.